Generally speaking, girls are much picky when it comes to their daily travel transport, but they share the common ground: it had better be beautiful. Maybe, a travel tool caters for girls’ aesthetics, which is Fosjoas V2 twin wheel electric scooters. It is famous for intelligent and magical riding mode, cute figure, smooth line and charming color. Girls will fall in love with it at the very first glance. The following will prove that. 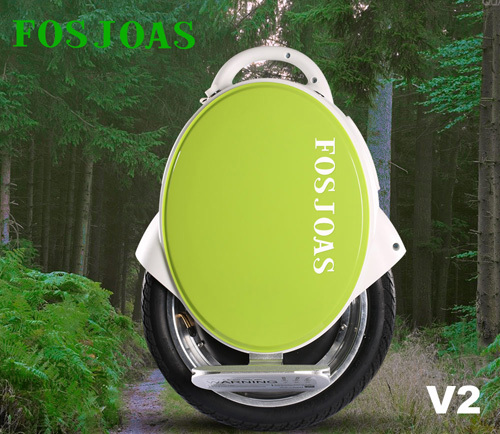 Beautiful removable cushion pads of Fosjoas V2 twin-wheeled self-balancing scooter place an important impression on girls. They have two colors-Azure Blue and Lime Green. Every girls love those two colors. They can buy both and rotate azure blue or lime green as they like. Next, the cute figure and smooth line also attract girls. Fosjoas V2 twin-wheeled self-balancing scooter is made from high-end materials and personally designed by world-class designer. It is no wonder that girls will fall in love with it. Speaking of basic riding mode, it makes girls love Fosjoas V2 electric scooter to die. It is powered by lithium-ion battery, which is totally different from strength-driven bicycle. At the same time, all controls, including accelerating, decelerating, steering and braking, are realized by changing body focus. Girls just need to move body and freely weave on road. All girls love shopping and Fosjoas V2 electric scooter can help them. They can ride it in large-scale shopping mall and have a window shopping one after another. When they try on new clothes, Fosjoas V2 can be put in any corners. After shopping, they can ride it to find delicious food. Fosjoas V2 makes every Saturday and Sunday amazing. Of course, Fosjoas V2 electric scooter is also a great commute transport. Girls won’t be stuck in traffic congestion and don’t need to strive for a parking lot anymore.